AGENDA: To study the art and culture of the Tlingit people first hand. To understand how these people with an elaborate social structure developed such an elaborate art form. 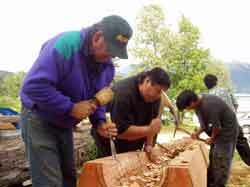 To reinterpret these ideas as individuals and observers, and develop ones own direction by sculpting in wood, using tools and techniques that are traditionally used on the Northwest Coast. Some tools are commercially available; some will be custom made to fit each individual hand. To visit the wilderness by hiking, beach combing and picnics. We will share ideas, intermingle with the locals, and enjoy a rare opportunity that most tourists will never experience. ACCOMMODATIONS: both workshop and housing is at Alaska Indian Arts, a non-profit Indian arts training center. AIA is located in historical Ft. William H. Seward; an Army base built in 1903 to control the Alaska gold rush. AIA was once the hospital building for the fort. First floor is the art center; second floor is housing for the artists. We will divide 10 to 12 people into three large rooms and two small rooms. We will cook group meals together. We will become "family" for three weeks, living, eating, enjoying the sights and intensively carving wood. *Other options for housing are available, such as bed and breakfast rooms within close walking distance. Or camping! "The exciting thing is to be in the environment where large totems in the Tlingit tradition are being produced. This energy is inspiring to all levels of skill. 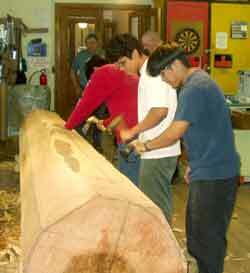 Alaska Indian Arts is proud to offer woodcarving workshops with Dave Svenson. 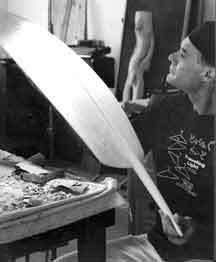 David first began working at Alaska Indian Arts in 1969. He has continued to work with the local artisans on large totem projects. David brings students primarily from the Acaemy of Art College in SF to study woodcarving techniques of the Tlingit tradition to incorporate into their individual sculptural ideas. 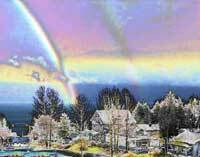 David is best known for his sculpture in glass and neon, often with a Northwest Coast theme.